Yes it's turkey time but not in France. I received a tip from my neighbor Daniel Flores, the pastor of Calvary Chapel in Lyon and Chambery. Last year they were able to get turkeys from Auchan for their church thanksgiving dinners. I went to check it out. Auchan at Port des Alpes near Ikea had no turkeys, so I picked up the poultry help line in the meat section and was received by a nice gentleman named Alain. He said they had had turkeys but no one bought them they went bad, and they stopped ordering them. However, he said if someone really wanted one before december they might be able to get one for them. It was disappointing. I walked around for a while looking for my mother in law who'd wandered off. I must of have looked unhappy because he came back over to me and says, hold on, I'm going to call my supervisor and check. He picks up the phone and calls Philip. The final word is that there will be turkeys the week of Thanksgiving! Alain was very happy and very proud to have put the smile back on my face :) A word of caution though, this year Daniel got the Auchan in St Genis Laval to commit to ordering them a turkey but then they got word back that their provider refuses to kill their turkeys before the 1st of December. So whatever you do, if you plan on getting a whole turkey, keep a plan B in mind. Some other places to check... over a decade ago I was able to order a whole turkey from a nice man at the daily market off the square at the Croix Rousse. I have heard from others that they have also been able to get whole turkeys there over the years. That market is closed on mondays. I've heard you can also get them at Les Halles. You can check your local butcher, or the poultry stands at the markets, particularly the local producers markets, but you need to start looking right away since it takes time once the order is placed for the turkey to be ready for consumption. And if you find a whole turkey, make sure it fits in your little french oven before you buy it!!! In case anyone is looking for a turkey, I just bought one this evening (22/11) at Auchan Porte Des Alpes. I paid 14.99 euros for the 3,300g bird. 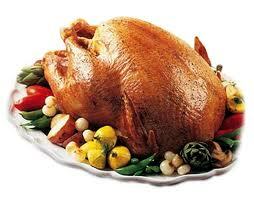 I found a fresh 3.2kg turkey as well last night at Auchan Porte Des Alpes -- thanks for the tip! I also managed to find cranberry sauce at the same store. It's in the foreign foods section with British items. my plan B is roasting a turkey leg for 2... no candied yams for me this year. Didn't plan ahead enough.